Buy the newest modulation paint with the best sales and promotions. Find cheap offers for modulation paint in our online store. _ AK132 Olive Drab Shadow. 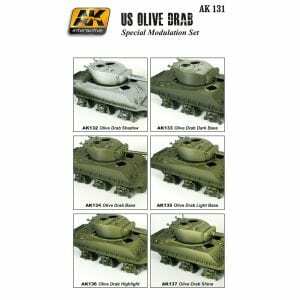 _ AK133 Olive Drab Dark Base. _ AK134 Olive Drab Base. _ AK135 Olive Drab Light Base. _ AK136 Olive Drab High Lights. _ AK137 Olive Drab Shine. 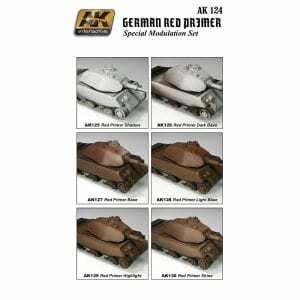 _ AK162 Dunkelgrau Dark Base. 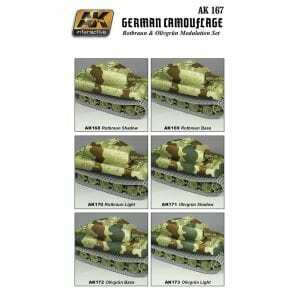 _ AK164 Dunkelgrau Light Base. _ AK165 Dunkelgrau High Light. 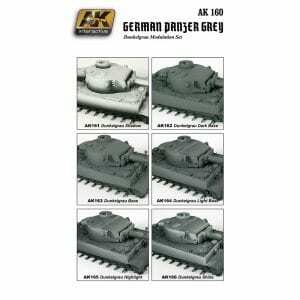 An essential set for those modelers that paint German vehicles with a three tone camouflage. Here are included three colors to modulate the German Brown and another three colors for the German green. 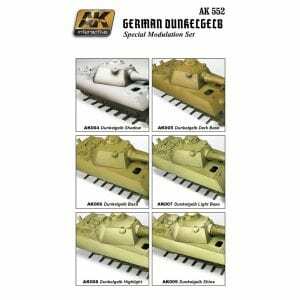 The modeler can use it in combination with the AK552 set to modulate the Dunkelgeb, the famous German dark yellow. _ AK005 Dunkelgelb dark base. _ AK007 Dunkelgeld light base. _ AK008 Dunkelgelb high light. Este set incluye seis diferentes colores acrílicos para la creación de un efecto de modulación en los vehículos pintados en verde ruso 4BO. Esta gama de colores ofrece la combinación precisa de tonos para lograr la perfecta modulación. Los seis tonos permiten obtener la transición sutil de color, y se recomienda no evitar ningún color. Cada color es diferente y ha sido estudiado a fondo para crear un efecto luminoso óptico. Además, estas nuevas pinturas cuentan con un acabado ligeramente satinado que permite al modelador evitar la necesidad de aplicar un barniz después. Las pinturas acrílicas de AK son solubles en agua y se pueden aplicar con pincel y aerógrafo. _ AK029 Russian 4BO shadow. 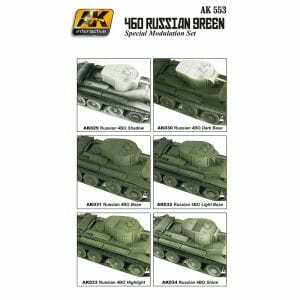 _ AK030 Russian 4BO dark base. _ AK031 Russian 4BO base. _ AK032 Russian 4BO light base. _ AK033 Russian 4BO high light. _ AK034 Russian 4BO shine.